We’d love your help. Let us know what’s wrong with this preview of Opera A to Z by Liddy Lindsay. To ask other readers questions about Opera A to Z, please sign up. I received a review copy of this book from NetGalley. The existence of this book frankly puzzles me, because tweens a) don't generally like opera and b) don't generally use reference books, so the market for a tween opera reference book seems mighty slim. The book struggles with the typical problems suffered by mass-market opera books: trying to stuff 3 centuries of art made in several European cultures into one slim volume is not going to go well. However, on the off-chance you're somehow in the I received a review copy of this book from NetGalley. Opera A To Z by Liddy Lindsay succeeds in making opera more accessible. Starting by explaining the four composers who form the pillars in opera, Mozart, Puccini, Wagner and Verdi, the book then goes through the alphabet, with each letter representing a different opera. There are brief descriptions of each featured opera with composer dates, year performed and other facts. There is a glossary of terms in the back for quick reference, as well as places to view operas. 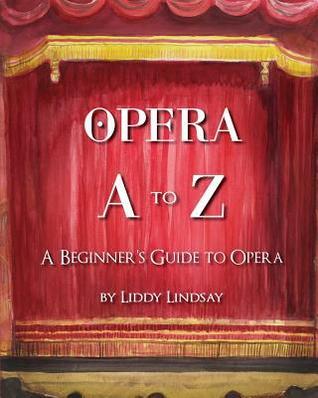 The book features full color wa Opera A To Z by Liddy Lindsay succeeds in making opera more accessible. Starting by explaining the four composers who form the pillars in opera, Mozart, Puccini, Wagner and Verdi, the book then goes through the alphabet, with each letter representing a different opera. So how does she represent opera? Quite well, actually. She explains the basics, from the fact that it’s an art form that has developed over four distinct periods, what an opera entails and some of the technical terms like libretto, overture, aria, etc. These are all explained thoroughly in the introduction but Liddy Lindsay actually had faith in her tween audience and decided not to overdo the explanation part. Her writing style is simple but easy to read, so I doubt there’s much danger of misunderstanding in the beginning. When she launches into her list of operas from A to Z, she really shows her knowledge of opera in an easy to read and understand way. For each opera, she gives a brief summary of the plot and explains certain famous elements (i.e. the habanera from Carmen). And for beginners, that’s really all you need. The illustrations she provides are awesome even on my Kindle, but I still highly recommend picking up the print copy to fully appreciate them. My only real criticism of the book besides from the occasionally slipshod proofreading is that in her plot summaries, Lindsay greatly oversimplifies things. She tells them in a simpler manner than they are told in the actual opera, which I can see why she did but I still didn’t like. It sort of misrepresents the opera, or its plot to be more accurate. I could dispute some of her choices for letters, but I won’t as they’re a matter of personal preference more than anything. Overall, I was actually quite pleased at the selection of time periods and composers that Liddy Lindsay chose to include. She includes every opera from Aida to Vanessa and every composer from Verdi to Francesco Cavalli. It’s quite an impressive selection and even I learned some new things. If you’re looking to get into opera or just want to know what the heck all the fuss is about, this is the book for you. And maybe, just maybe, you’ll give opera a chance and have that magical moment where you inexplicably fall in love with it in the midst of watching one. I know I did. This is what I needed as a kid. Yes, I know encyclopedias seem played out now that we have Google and Wikipedia but this small compilation is perfect for anyone willing to really learn the basics of opera. Not only does it have vivid and beautiful paintings inside, it also gives a glimpse at major composers and detailed definitions of what constitutes an opera. The only thing that I really think would add to this (strictly as an opera singer) is the type of voices that originally sang the parts the way that the composers intended. Even if it's just two characters one being Coloratura and the other being a baritone. I've always found the voice type really adds dimensions to the characters and it would give me something to hear as I'm reading it. But the intention of Opera A to Z is a beginners guide. Again, I wish that my parents had had the forethought to get me something similar as a child instead of looking at me like I was a strange alien whenever I wandered around singing Addio Del Passato but what can you do. Opera A to Z begins with a brief history of the art form, followed by 26 synopses of operas from all time periods, one for each letter of the alphabet. Each plot summary is accompanied by a watercolor illustration depicting a scene from that opera. The book concludes with a few pages defining common musical terms. Liddy Lindsay's watercolors are incredibly interesting, beautiful, and I loved how colorful they are. But a few of the illustrations simply did not garner as much of my enthusiasm as I Opera A to Z begins with a brief history of the art form, followed by 26 synopses of operas from all time periods, one for each letter of the alphabet. Each plot summary is accompanied by a watercolor illustration depicting a scene from that opera. The book concludes with a few pages defining common musical terms. Liddy Lindsay's watercolors are incredibly interesting, beautiful, and I loved how colorful they are. But a few of the illustrations simply did not garner as much of my enthusiasm as I expected. This is such a subjective thing, though, so I encourage you to view the images yourself on her website. This is a brief book which provides a great deal of breadth, impressive considering Lindsay was limited to only 26 selections! Well-loved operas and lesser known works are both covered, and from a balanced variety of time periods and composers. Opera A to Z is geared for ages 8-12, but it is also appropriate for anyone older than that (I'm not sure it would hold the attention of many younger children). This is a good resource with solid information for anyone looking for an introduction to opera, or for anyone (like myself) who could use a quick reference/refresher of opera storylines. American guide to the classical European art of opera. It describes the Baroque, Classical, Romantic and Modern eras. The guide focuses on four famous opera composers (Mozart, Puccini, Verdi and Wagner) and the narrative aspect of twenty-six operas. Before the Modern era, operas often looked backward admiringly to the good old days or myth - marginalising the New World and much beyond the Mediterranean. Twenty-six operas (ordered alphabetically) are covered, including some from each era. For eac American guide to the classical European art of opera. It describes the Baroque, Classical, Romantic and Modern eras. The guide focuses on four famous opera composers (Mozart, Puccini, Verdi and Wagner) and the narrative aspect of twenty-six operas. Before the Modern era, operas often looked backward admiringly to the good old days or myth - marginalising the New World and much beyond the Mediterranean. Twenty-six operas (ordered alphabetically) are covered, including some from each era. For each opera there is the title in the original language, the name of the composer, his date and place each of birth and death (every selected opera is composed by a dead male), the year of its premiere, a complete narrative plot and a full-page watercolour depicting characters or settings or scenes from the plot. There is some risk in the stylised art - while children often love interpreting made things, to a naive viewer the subtle ease looks like artless finger painting. I expected the paintings to be a big plus. While obviously the whole picture book thing was discounted because I read it on a Kindle (third generation, so it's still black-and-white), I looked up the author's website shortly afterward, and the paintings were not spectacular as some other reviewers on Goodreads have said-- in fact, they looked somewhat pitiful and amateur. I mean no disrespect to the author by saying this; in fact, the writing was very informative. However, I was quickly bored, without any deviation from the almost monotonous structure to keep me interested. Opera and music lovers will appreciate this alphabetical review of famous operas. It begins with a brief explanation of the history and development of opera and a few of the most famous composers. Then it begins a journey through operas from all four major eras, sharing a short description of the storyline and major characters in each. Each entry also lists the composer of the opera, the dates of his birth and death, and the date the opera premiered. There is an illustration to accompany the ent Opera and music lovers will appreciate this alphabetical review of famous operas. It begins with a brief explanation of the history and development of opera and a few of the most famous composers. Then it begins a journey through operas from all four major eras, sharing a short description of the storyline and major characters in each. Each entry also lists the composer of the opera, the dates of his birth and death, and the date the opera premiered. There is an illustration to accompany the entry which shows a scene or central character. Where additional information is helpful, it is included in an aside at the end of the entry (the author has already explained that in opera a character can address the audience directly in an aside). For readers who want even more information, there is a section where key terms are defined, and the major eras, genres, and vocal types are explained. Places where you might find an opera performance are shared along with a bibliography of the author's sources. This book fulfils its promise of giving a brief synopsis of each opera, written in a simple way, for children. I didn't like the illustrations, which seemed to be rather amateurish, but overall a nice idea, great for introducing children to the magical world of opera. Reviewed in exchange for a preview Kindle copy. What a fantastic little book! It's really gotten me back into opera. The fun art and little blurbs of text really piques your interest with each piece, making you want to listen to it right away and hear the story that you've just read. With notes at the end to Operatic techniques and little must-know tidbits helps you really understand and with an extensive bibliography it's easy to look for other texts for further understanding. A wonderful addition for any aspiring opera lover's collection. Small picture book technically for children to know the general outline of the plot and the most famous arias of the best-known Operas, also interesting for the adults. Piccolo libro illustrato ad uso dei bambini per conoscere a grandi linee la trama e le arie piú famose delle opere piú note, interessante anche per i piú grandi. THANKS TO NETGALLEY AND PINWHEEL BOOKS FOR THE PREVIEW! Information good; illustration.... Not a fan. Color choices seem muddy. Clever idea, not sure who the market is though--too many words for proper picture book and possibly too childish looking for average middle schooler looking to get some quick info about opera. 2.5 stars. I want to like it, but I don't :/ full review to come.